↑ Freitas, Antonio Maria de (1893). The Wife of Columbus: With Genealogical Tree of the Perestrello and Moniz Families. প্ৰকাশক New York: Stettinger, Lambert & Co. https://archive.org/details/wifeofcolumbus00frei. ↑ "The Spanish Conquest of the Tainos" – Latin American Studies–Retrieved 10 July 2011. ↑ "Teeth Of Columbus's Crew Flesh Out Tale Of New World Discovery". Science Daily. 20 March 2009. ↑ Giles Tremlett (7 August 2006). "Lost document reveals Columbus as tyrant of the Caribbean". The Guardian (UK). Retrieved 16 May 2013. 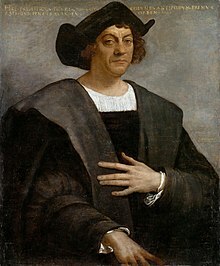 ↑ "Christopher Columbus Suffered From a Fatal Form of Arthritis". University of Maryland School of Medicine. Retrieved 11 August 2013. ↑ Hoenig, LJ (February 1992). "The arthritis of Christopher Columbus". Archives of Internal Medicine 152 (2): 274–7. doi:10.1001/archinte.1992.00400140028008. PMID 1472175.